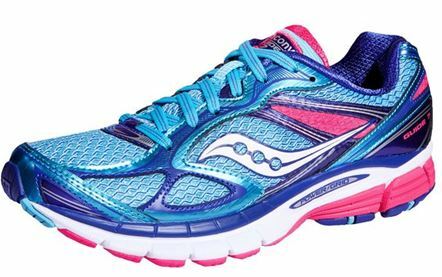 The Guide 4 was built like a more traditional running shoe with a twelve millimeter heel-to-toe offset. It used Progrid foam as its cushioning system and weighed in at 11.6 ounces. The Guide 5 changed quite a bit from the Guide 4, reducing the heel-to-toe offset to eight millimeters and dropping the weight to about 10 ounces. This model had some issues with wearing down quickly, especially the mesh over the toes. The Guide 6 made some modest changes, with a sleeker fit in the toe box and a new triangular pattern on the outsole. The Guide 7 has a few updates that really take the shoe to the next level. The Progrid cushioning has been replaced with a foam called Powergrid, which is both lighter weight and more durable. The triangular patterns on the outsole have been replaced with a more traditional pattern that includes new “pods” that add stability to the shoe without adding to the medial post (the dense corrective foam on the medial side of the shoe). 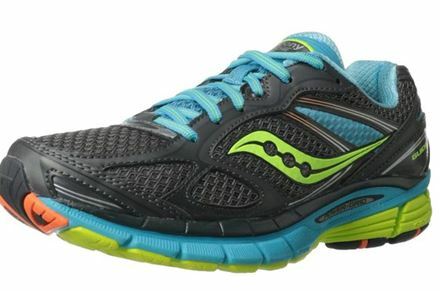 The Saucony Guide 7 maintains a sleek fit, similar to the Saucony Guide 6. I have a relatively wide foot, and I was able to fit into the Guide 5 easily but in the Guide 6 and 7 I have had less space to work with. It is an especially close fit where the tongue ties in to the upper of the shoe. My initial impression when sliding my foot into the shoe was that it was too narrow, but for some reason I found that the shoe actually fit a little better when it was laced up. Just to make sure, I tried on a second pair of Guide 7’s in the same size and found the same thing. My guess is that this fit will actually work quite well for the person with an average-width foot. It will be a close fit, which prevents sliding around, but it will not constrict the foot. I never had to think twice about the lacing in this shoe, or about the heel sliding out. That is always a good sign. The heel counter was not as padded as other shoes, but it held much better than most. The ride of this shoe is excellent. It is soft the whole way through the shoe, and the transition from heel to forefoot is very smooth. The front half of this shoe feels especially cushioned, which I like a lot because I have had issues with bruising my forefoot in the past. I have generally gotten an average amount of use out of the Guide series, which for me is between 350 and 400 miles. The last couple of Guide models have lasted around 350 miles for me, and then they have been totally beat down. It almost seems like I have beat the soft Progrid foam down to a thin, flat version of its former self. I never had any problems with the mesh over the toes breaking through, but I have talked to a good number of people who did have that problem. The Guide 7 feels like it is going to last a little longer. The Powergrid cushioning material does feel like it holds up a little better than the Progrid material of old, but it still gives that great soft feel. The mesh on the shoe feels substantially stronger than in previous models. I still have not had any issues with it breaking through, and I have not heard of many others who have had that problem with the newest Guide. Overall, this is a fantastic shoe for the slight overpronator. It is very light, very well cushioned, and has a smooth ride that just feels right. The lower heel-to-toe offset might be a slight adjustment to those transitioning from a more standard twelve millimeter offset shoe, but most probably will not even notice the difference. If you are looking for a lightweight, everyday trainer with a touch of support it is in your best interest to give this shoe a try. This entry was posted in Running Shoes, Saucony. Bookmark the permalink.